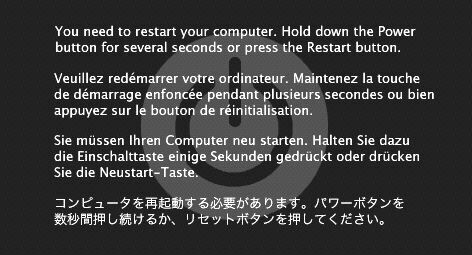 Some users came to me because their Macbooks crashed, and there was a message shown on the screen: You need to restart your computer. Hold down the Power button for several seconds or press the Restart button. They tried the steps as suggested by the message and restarted their computer. However, they still ran into the same problem. This message indicates a kernel panic condition. This may be caused by corrupted system files or hardware failure. Oftentimes, it is only a glitch. A simple restart may fix the problem. However, the aforementioned users had tried to restart the system, but it still didn’t work. I tried to boot the computers to target mode to get some important files off of the laptops, and the Macbooks did not boot to target mode. Instead, they booted normally. Problem solved. For those of you who aren’t familiar with “target mode,” target mode allows your Mac work as an external hard drive. To enter target mode, you first shut down the computer. Then you press the power button again to turn it on while pressing and holding the “T” key. Once it is in target mode, you can connect the computer to another Mac using a firewire cable. The computer in target mode is just like an external hard drive to the other Mac. Restart with the X key. Restart with the Option key.